Part I of the Sales Superstar Series lays down the proper foundation and exact steps to sales perfection. Beyond being just a simple map it propels you forward into action. It includes: How to believe in your Product and Yourself, The Fundamentals of a Perfect Sales Presentation, and The Fundamentals of Personal Sales and Earnings Growth. This series creates a foundation that will allow you to quickly excel whether you are a beginner, intermediate or pro. 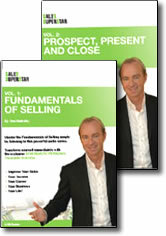 Leverage the sales fundamentals you mastered from Part 1 and take yourself to the next level! Learn exactly how to successfully prospect and cold call, handle objections, telemarket, and most importantly how to Close at an extremely high level. Part 2 addresses many intangibles including, How to get out of a Slump, Harnessing the Power of Failure, Having a Breakthrough, and How to Find the Best Area. The entire Sales Superstar program is enhanced by The Truestar “Synergistic Personal Training System” which begins on CD 10. The power of the Sales Superstar Program can propel you towards self-actualization.